The Historic Redland Trail is a stretch of land that goes from Miami to the Keys. There you can find many Miami attractions. From restaurants to the Monkey Jungle, the trail has everything families could want. There are even shops where you can get some of the best orchids and bonsai trees around. RF Orchids is just one of the members of the Redland Trail. Here, you can buy Orchids and everything you will need to care for them, as well as getting to see the shop's Jade Vine and Schombocattleya Diamond Head. There are also garden tours available so you can see some of the other beautiful exotic plants RF Orchids has. Another member of the Trail is Coral Castle, a spectacular rock park created by Ed Leedskalnin. Leedskalin spent the last 28 years of his life hand carving these amazing structures with no help in tribute to a lost love. This structures can be seen on any of the many tours the Coral Castle offers. The Coral Castle is open every day, and it is an affordable way to spend an afternoon. If seeing animals is what your after, why not visit the Everglades Animal Farm or the Monkey Jungle? These wonderful Miami attractions offer visitors the opportunity to see some of the most awe-inspiring animals in the world. 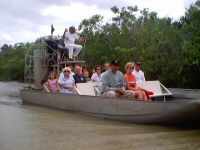 Originally a place to take air boat tours, Everglades Animal Farm, it is now also a working alligator farm. The farm was started as part of a preservation effort after the American Alligator became endangered in the 1960's. There, people can not only see alligators of all sizes, but they can also go on an air boat tour, or see the many species of snakes living there. The air boat tours also allow people the chance to catch birds, fish and turtles in action in their natural environment. Monkey Jungle is the only protected habitat the public can see for themselves in Miami. At Monkey Jungle, you can check out the huge domes that have a large variety of exotic birds. Tired from all your exploring? Relax and have something to eat at the Capri Restaurant, which features great Italian food and quality wine. Being one of the best Miami restaurants, Capri Restaurant is family-owned establishment that has top chefs who will cook your food just the way you like it. Also, you can stop at "Robert" where you will be able to get some of the best tropical fruits the state has to offer, as well as fresh fruit milkshakes and Key Lime pie. For adults looking for a great night out, consider Schnebly Redland's Winery, home to an ever-growing variety of quality wine. Other must-see destinations on the Redland Trail include the Bonsai Garden, The Tropical Everglades Visitor and The Fruit & Spice Park. To see more information on them and the others check out RedlandTrail.com. For information on renting apartments for vacation, go to Miami Vacation Rentals a place that offers quality Miami accomodations.